This will be a really useful book as you sit listlessly in the heat, wondering what on earth you can do with your summer holidays. 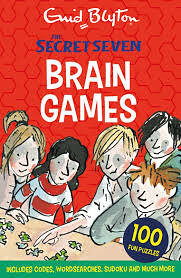 Alongside Pamela Butchart’s new Secret Seven mystery, Tony Ross has been busy drawing quizzes and puzzles for fans, with Mandy Archer writing all the clever stuff you can try to figure out with the Secret Seven Brain Games. I really like the look of this, so it’s lucky I am old, which means I am busy, which means I will not ruin this book for someone who might enjoy it. Although, I do think I’d enjoy it too. 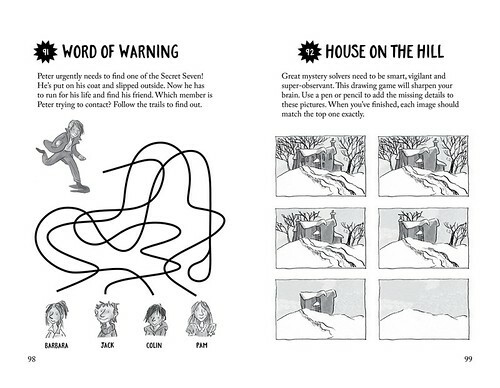 There are all the classic brainteasers, with maps and codes, for this is Blyton territory. Crosswords, sudoku and so much more! Someone come and take this book off me before I succumb! The Secret Seven are back, folks. Enid Blyton doesn’t allow just anyone to pretend to be her and write her books, now that she’s dead, but Pamela Butchart has been given the job we all wanted. Hands up those of you who never attempted to write a Blyton book of your own! I surprised myself by liking this book very much. 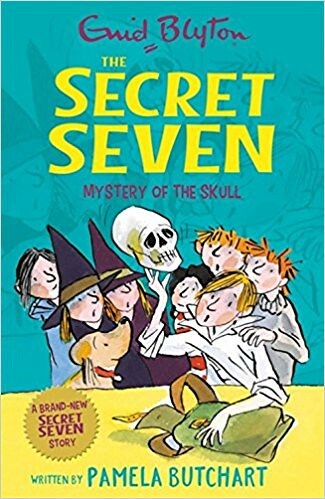 The Secret Seven were not my most favourite series, but I reckon I read all or most of the books. Between us my friend next door and I mangled the names of all seven, and it’s odd how quickly I discovered I was again muttering Coolinn and Yuck and all those other exotic English names. Barrbarra. Yahnett. You know. Anyway, Pamela has created a believable Blyton mystery, with skulls and pineapple upside-down cake and passwords, sneaking out in the middle of the night and having police who come when you need them. The crime/mystery is fun and relatively simple, the baddies are just the right kind of bad, and oh, those feasts in the shed! I could kill for such a feast, even if I could make the food myself now. It’s jolly, and friendly and exciting. Illustrations by Tony Ross, naturally, and the publishers are re-issuing the old Secret Seven adventures. I don’t know if more new books are planned, but I’d welcome them if they turn up. Mystery of the Skull took me straight back to childhood, and what a nice visit it was. The days are getting shorter. Well, I suppose it’s that time of year. And it felt like even the long trains were also shortening; unless there really were that many extra daytrippers yesterday, being a Sunday and that. I didn’t quite make it to see Jo Nadin or Tony Ross at their signings, but you can’t have everything. 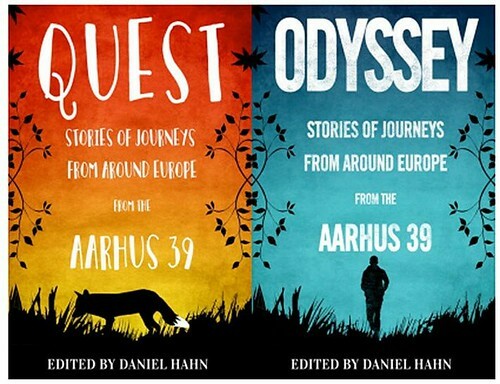 I was there for the event with Maria Turtschaninoff and Alwyn Hamilton, chaired by the little known Daniel Hahn. 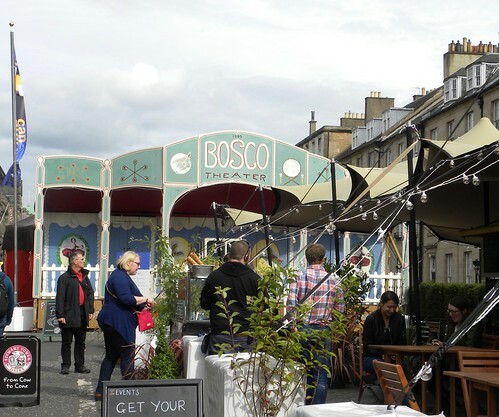 It was in the new Bosco Theatre venue, out on George Street, and this was my first time. What I will say is that Theresa Breslin was spot-on earlier in the week, when she said it was lovely, but not for wearing stiletto heels in. At the time, Keith Charters and I looked at each other, both fairly secure in the knowledge that we wouldn’t be. 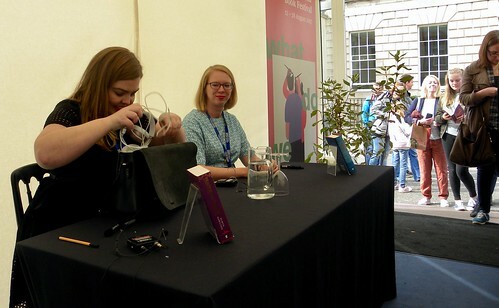 The other thing about the venue is that the signing tent is very small. No room for Bookwitches wanting to take pictures, except for this close-up of Alwyn’s handbag contents. But I dare say it wasn’t made with me in mind. 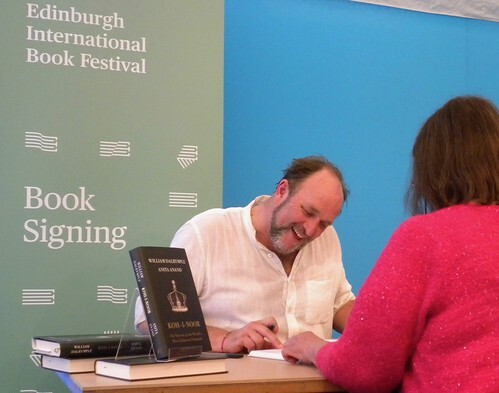 After this fantasy event I wandered back to Charlotte Square, catching William Dalrymple signing for a queue of fans, after what looked like a full Main Theatre event. I feel I know, as I stood there trying to take photographs of Chris Close’s picture display, and I tried at just the wrong moment, when the whole tent walked past, very slowly. Well, obviously it wasn’t the actual tent that moved, but the people who had been in it. Hoped to see Ross Collins and Claire Barker after their event, but they must have been busy chatting to admirers, as they hadn’t emerged when I had to make a move. Because, dear readers, I had an interview to conduct, and was meeting Maria Turtschaninoff in the gap between her own event and seeing Jonathan Stroud. We sat in the sunshine on the deck outside the authors’ yurt, chatting about mothers and books and how arrogant Sweden is towards the other Nordic countries. I mean, I said that. Maria is far too polite to. And as she went off with a bagful of Lockwood books, I walked to Waverley again, prepared to fight the other festival-goers, but struck lucky by finding an unexpected train going my way a couple of minutes later, and it wasn’t even full. 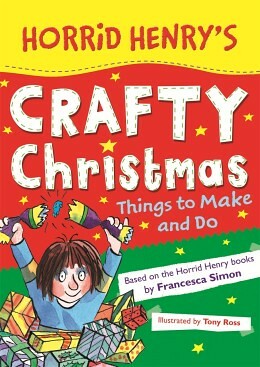 Or, to make proper use of alliteration, Horrid Henry’s Crafty Christmas. It’s a book about things ‘to make and do.’ So I don’t think it’s actually by Francesca Simon, it is about her creation Henry, and features ideas for what to do at Christmas. At any time of the year, if you’re feeling Henry-ish. It is filled with ‘boredom-banishing stuff’ and when mentioned at the same time as Horrid Henry, it rather fills me with dread. Like, what will he be getting up to next? But it is – probably – totally innocent. Scissors, hole punches, sticky tape; what could possibly go wrong? There is baking and slime and rude crackers. Sorry, Rude Ralph’s Christmas Crackers. Occasionally it says to ask an adult to help with certain parts of the crafty doings. Well, do you really think Henry’s friends will give up the separating of eggs to someone else? I like – used to like, anyway – crafts books and tips. They’re fun. Irresistibly fun. So have some horrid fun! And don’t blame me. 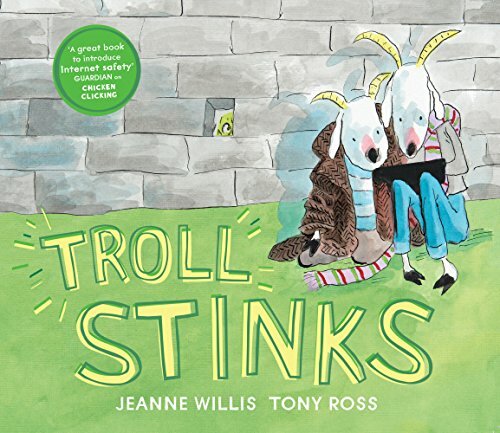 It looks like Jeanne Willis has her heart set on educating young readers, and what better way than through poetry and catchy illustrations? Jeanne rhymes her way through a different version of the Billy Goats Gruff, where a young silly Billy finds a mobile phone and decides to get up to no good with it, along with his friend. They take selfies and send horrible text messages to Troll. And then they go off to visit Troll. Aren’t they brave? Well, no, they are bullies. The thing is, just as goats – maybe – have the right to cross bridges; perhaps trolls are entitled to try and prevent them? Goldilocks had her porridge. Or, to be more precise, she had porridge belonging to the three bears. And one of the porridges was just right. The last books I read about Goldilocks and her pal Jack, of beanstalk fame, were the new boardbooks by Tony Ross earlier this year. Boardbooks are hard to review, and fairly hard to pass on to a suitable reader. When you’re my age you don’t know many boardbook-aged people. The other day I went out to lunch. It was a free lunch; pea soup followed by pancakes with cream and jam, Swedish style, all eaten in good company. I actually remembered to bring the books, and after a happy coincidence of chatting about books, I even remembered to get them out of my bag, to hand them to Baby Tollarp. This lovely child threw himself over the books, and immediately started to gnaw the edges and the corners. Most gratifying. It was lunch, after all. And whereas he was allowed to sample a sliver of pancake, this six-month-old only had literature to satisfy that empty feeling.